Download "Terms and Conditions. Undergraduate students enrolling in September 2015"
2 you have any outstanding tuition fees. Please note that if you do not pay your fees by the appropriate due dates, your student ID card may be deactivated. This may mean that you no longer have access to University facilities, including its buildings and online resources. You understand that, by enrolling with the University, you are giving permission for information, including what is on your enrolment form, to be used by the University, including any formal partners, to maintain your student record and monitor your experience. As a student, you agree to observe the University Regulations and Policies as described in the Essential Westminster Student Guide and Handbook of Academic Regulations, and to submit to its discipline, while a student of the University. If you decide to withdraw from your studies, there may be a financial implication. Please read this information carefully which can be found at: data/assets/pdf_file/0012/162012/withdrawal-from- Studies-Form pdf You understand that under the Data Protection Act 1998 (DPA) you have the right to check the information held about you, but you also have the responsibility to ensure that this information, e.g. contact details, is accurate and up-to-date. 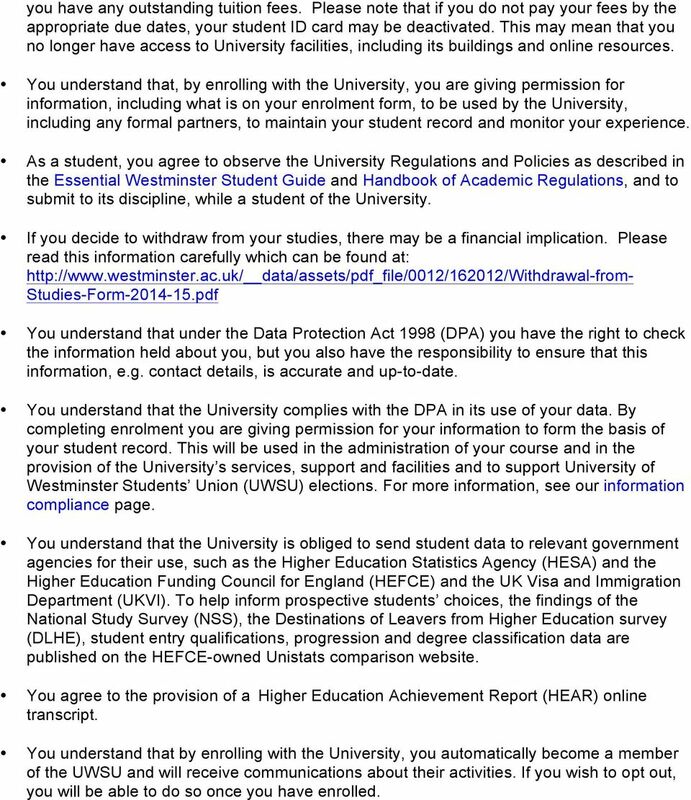 You understand that the University complies with the DPA in its use of your data. By completing enrolment you are giving permission for your information to form the basis of your student record. This will be used in the administration of your course and in the provision of the University s services, support and facilities and to support University of Westminster Students Union (UWSU) elections. For more information, see our information compliance page. 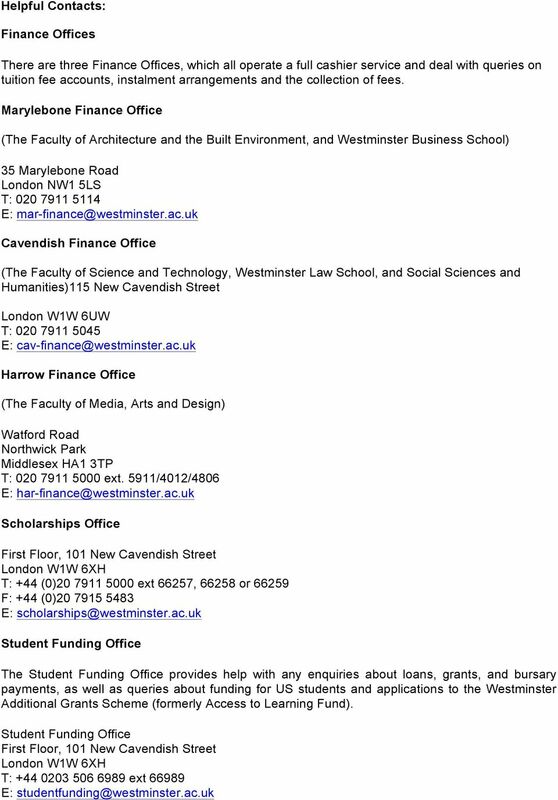 You understand that the University is obliged to send student data to relevant government agencies for their use, such as the Higher Education Statistics Agency (HESA) and the Higher Education Funding Council for England (HEFCE) and the UK Visa and Immigration Department (UKVI). To help inform prospective students choices, the findings of the National Study Survey (NSS), the Destinations of Leavers from Higher Education survey (DLHE), student entry qualifications, progression and degree classification data are published on the HEFCE-owned Unistats comparison website. You agree to the provision of a Higher Education Achievement Report (HEAR) online transcript. You understand that by enrolling with the University, you automatically become a member of the UWSU and will receive communications about their activities. If you wish to opt out, you will be able to do so once you have enrolled. 3 Additional Terms and Conditions for Students Requiring a Visa to Study in the UK All overseas applicants, apart from the exceptions given below, must pay a minimum tuition fee deposit of 4,000 before the CAS (Confirmation of Acceptance for Studies) can be issued. If you choose to pay your tuition fees in full before your visa appointment then you must pay the total fee due as written on your CAS confirmation or offer . 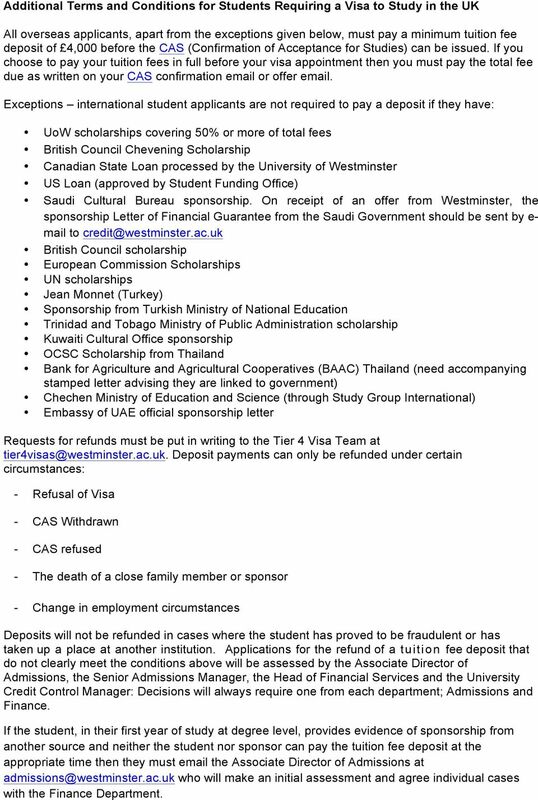 Exceptions international student applicants are not required to pay a deposit if they have: UoW scholarships covering 50% or more of total fees British Council Chevening Scholarship Canadian State Loan processed by the University of Westminster US Loan (approved by Student Funding Office) Saudi Cultural Bureau sponsorship. On receipt of an offer from Westminster, the sponsorship Letter of Financial Guarantee from the Saudi Government should be sent by e- mail to British Council scholarship European Commission Scholarships UN scholarships Jean Monnet (Turkey) Sponsorship from Turkish Ministry of National Education Trinidad and Tobago Ministry of Public Administration scholarship Kuwaiti Cultural Office sponsorship OCSC Scholarship from Thailand Bank for Agriculture and Agricultural Cooperatives (BAAC) Thailand (need accompanying stamped letter advising they are linked to government) Chechen Ministry of Education and Science (through Study Group International) Embassy of UAE official sponsorship letter Requests for refunds must be put in writing to the Tier 4 Visa Team at Deposit payments can only be refunded under certain circumstances: - Refusal of Visa - CAS Withdrawn - CAS refused - The death of a close family member or sponsor - Change in employment circumstances Deposits will not be refunded in cases where the student has proved to be fraudulent or has taken up a place at another institution. Applications for the refund of a tuition fee deposit that do not clearly meet the conditions above will be assessed by the Associate Director of Admissions, the Senior Admissions Manager, the Head of Financial Services and the University Credit Control Manager: Decisions will always require one from each department; Admissions and Finance. If the student, in their first year of study at degree level, provides evidence of sponsorship from another source and neither the student nor sponsor can pay the tuition fee deposit at the appropriate time then they must the Associate Director of Admissions at who will make an initial assessment and agree individual cases with the Finance Department. 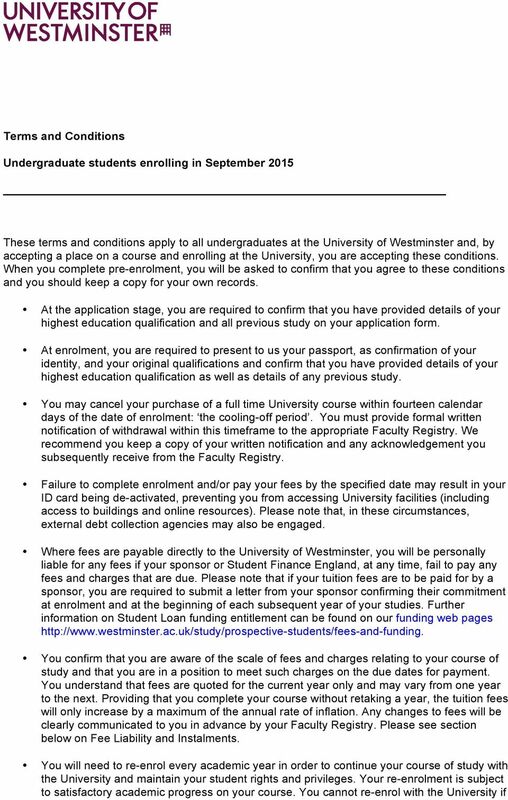 4 If you require a visa of any type in order to stay and/or study in the UK, the University of Westminster is required to keep a copy of your passport and visa showing evidence of your entitlement to study and the length of your permission to stay in the UK. You agree to: provide the University with your contact details in the UK (address, telephone number, mobile number and address) and to update these as necessary inform your Faculty Registry, in writing, of any absence from the UK during term time produce your passport, visa and original qualifications for checks upon request. There will be mandatory checkpoints for all students requiring a visa to stay in the UK, normally in December and March inform your Faculty Registry of any change in your immigration status provide evidence that you have left the UK or have transferred to another UK university if you leave Westminster before the end of your course. attend all lectures and seminars inform the Tier 4 team of any absence due to illness and provide medical evidence for any absence of 7 days or more. The University is under obligation to report to the UK Home Office any non-attendance, discontinuation of study, change of course, change of course duration, change of attendance mode, period of absence or work placement for Tier 4 students. 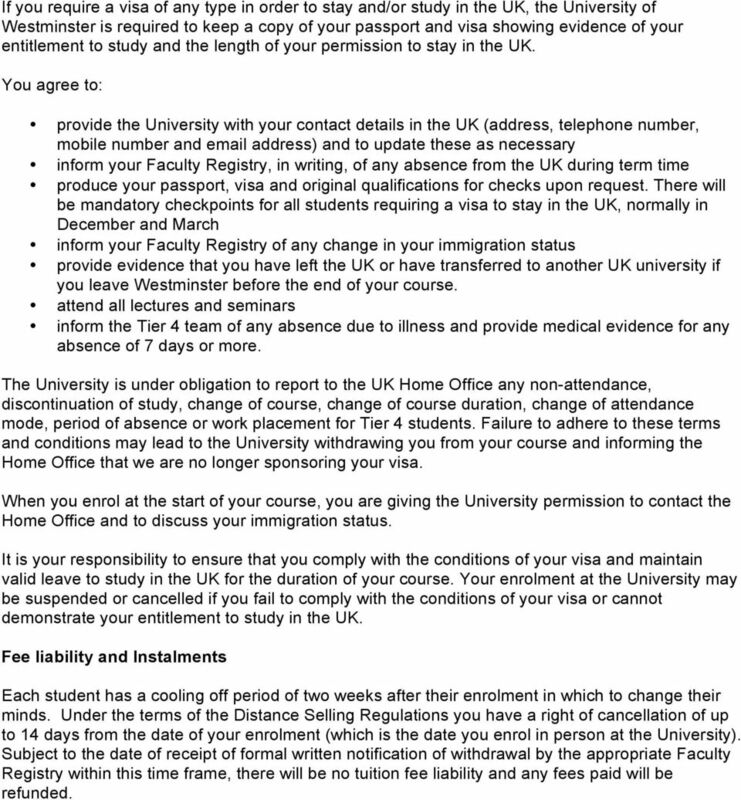 Failure to adhere to these terms and conditions may lead to the University withdrawing you from your course and informing the Home Office that we are no longer sponsoring your visa. When you enrol at the start of your course, you are giving the University permission to contact the Home Office and to discuss your immigration status. It is your responsibility to ensure that you comply with the conditions of your visa and maintain valid leave to study in the UK for the duration of your course. Your enrolment at the University may be suspended or cancelled if you fail to comply with the conditions of your visa or cannot demonstrate your entitlement to study in the UK. Fee liability and Instalments Each student has a cooling off period of two weeks after their enrolment in which to change their minds. Under the terms of the Distance Selling Regulations you have a right of cancellation of up to 14 days from the date of your enrolment (which is the date you enrol in person at the University). Subject to the date of receipt of formal written notification of withdrawal by the appropriate Faculty Registry within this time frame, there will be no tuition fee liability and any fees paid will be refunded. 5 Students starting in September 2015 Period First 14 calendar days after enrolment Fee Liability for SLC funded students paid for by the SLC Fee Liability for non-slc funded students First two weeks after enrolment 0% 0% 15th calendar day after enrolment - 17 January Before the notified start of second term 25% 50% 18 January - 15 April Second Semester 16 April onwards Notified start of third term 50% 100% 100% 100% The result of this is, if you are funded through the Student Loans Company, you will not have a personal fee liability if you withdraw or suspend at any time. If you are an overseas student, the refundable amount is the amount paid less the tuition fee deposit which is non-refundable. Liability for tuition fees and eligibility for fee refunds depend upon the date of receipt of formal written notification of withdrawal by the appropriate Faculty Registry. 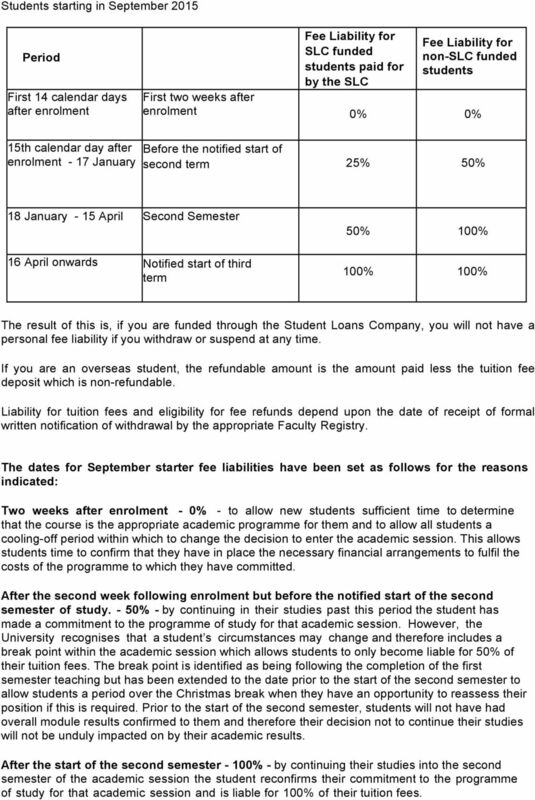 The dates for September starter fee liabilities have been set as follows for the reasons indicated: Two weeks after enrolment - 0% - to allow new students sufficient time to determine that the course is the appropriate academic programme for them and to allow all students a cooling-off period within which to change the decision to enter the academic session. This allows students time to confirm that they have in place the necessary financial arrangements to fulfil the costs of the programme to which they have committed. After the second week following enrolment but before the notified start of the second semester of study. - 50% - by continuing in their studies past this period the student has made a commitment to the programme of study for that academic session. However, the University recognises that a student s circumstances may change and therefore includes a break point within the academic session which allows students to only become liable for 50% of their tuition fees. The break point is identified as being following the completion of the first semester teaching but has been extended to the date prior to the start of the second semester to allow students a period over the Christmas break when they have an opportunity to reassess their position if this is required. Prior to the start of the second semester, students will not have had overall module results confirmed to them and therefore their decision not to continue their studies will not be unduly impacted on by their academic results. After the start of the second semester - 100% - by continuing their studies into the second semester of the academic session the student reconfirms their commitment to the programme of study for that academic session and is liable for 100% of their tuition fees. All fees quoted are subject to other costs arising from government directives. HE ATTENDANCE POLICY WQM068/June 2016/Version2 Attendance Policy: Principles and Procedures A Principles and Rationale 1. This Attendance Policy applies to all HE students at Writtle University College.